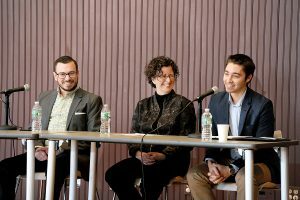 LEWISTON — They came from different backgrounds and business inspirations but they came together Friday to share with an audience some early take-aways. To grow a business be nice, hire smart. Expect challenges. Think running out of toilet paper in the staff bathroom. Or, adding 800 pounds of coconut to the wrong 8,000-gallon vat of beer. And, they told the room of people at the Great Falls Forum, fear is OK. Especially in the risky business world. 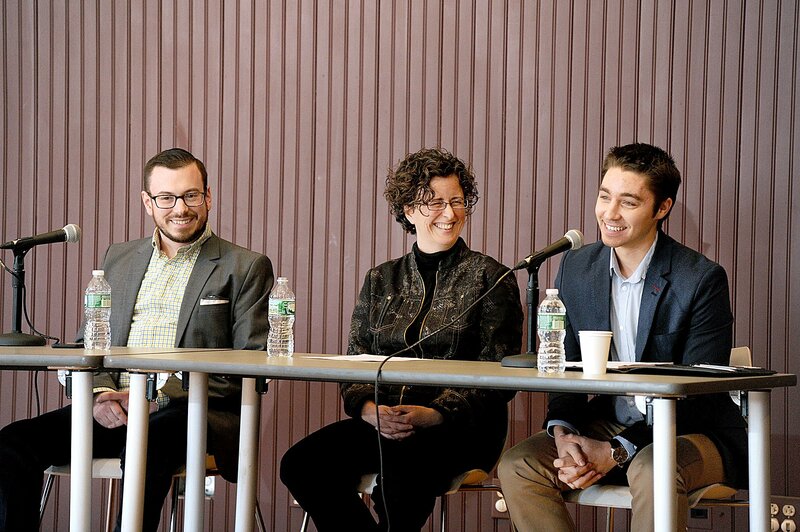 Jacques, Luke Livingston, the owner of Baxter Brewing Co., and Colby Michaud, the owner of Praxis Production Studios, headed up the “Getting Down to Business: Insights from Local Entrepreneurs” panel on Friday at the Lewiston Public Library. Michaud, who bought out his business partner a year ago, said they started out making real estate videos before branching into other multimedia and commercial work. He’s now a solo operation. Make mistakes, but make them quickly and fix them even quicker, he said. Jacques, whose business got a boost from the Androscoggin County Chamber of Commerce’s Launch L-A project in 2011, oversees 18 massage therapists and 22 employees. She had started as a sole proprietor, working from home, when she noticed more people calling to book a massage that day; she couldn’t do it, she was full several months out. She saw more people coming out of massage therapy schools and not finding work. And she noticed message therapy franchises popping up. Before Revelations launched, Jacques said she saved up so she could go 18 months without a salary. Start small and low-risk before scaling up, if possible, she said. Livingston has grown Baxter to 31 employees and expects to hire five more people this year. He got his start home-brewing beer in college and reviewing other people’s beer in a blog. They keep the office fun and that carries through in the brand, he said. There’s an annual office sailing retreat and they toss a football around the canning line. Some of his advice: Care for each other and care for your community. It could have been bad. But, they figured it out and moved on. “We were able to blend all the beer and the end result was delicious,” Livingston said. Asked about local resources, the panel recommended the Androscoggin Valley Council of Government’s small business office, getting involved with the Androscoggin chamber and Young Professionals of the Lewiston Auburn Area and paying a visit to Lincoln Jeffers, Lewiston’s economic and community development director.